No, not like the GM Death Watch at my favorite car blog; this is a “how long before somebody’s killed” series. 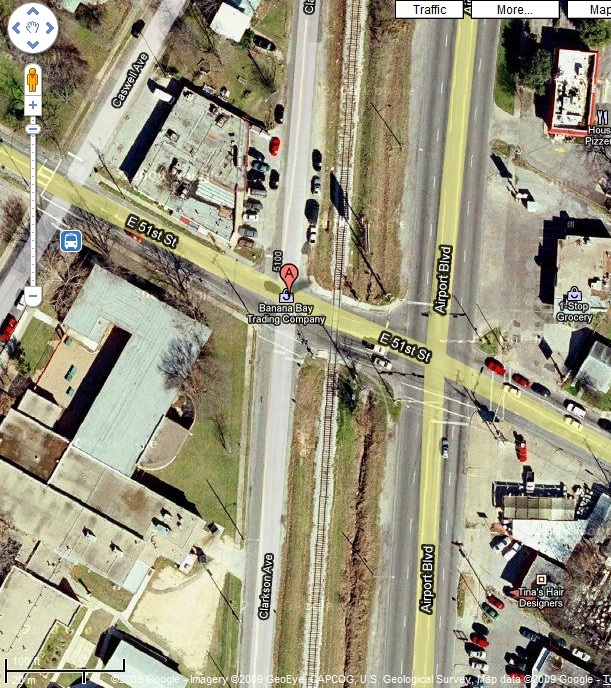 Today, some pictures of the intersection I talked about on KUT last week. First, the overheard. Imagine you’re headed west on 51st across Airport because you just went to Home Depot and are headed back to Hyde Park or points south. (Hint: Red River starts just south of this image as a turn off of Clarkson; turning on Clarkson is thus by far the best way into or around Hyde Park by car). Recording this email for posterity, stomach since I firmly believe this kind of discussion should be in the public eye – so it’s possible for others to see whether the input was acted on or just ignored (as is commonly the case). This is expanded feedback from the forum – as you may know I was on the UTC for 5 years and used to be a serious bicycle commuter and still maintain a healthy interest, and I live about 500 feet from the intersection in question. First issue is the fact that the bike lanes ‘downstream’ of the intersection were recently restriped all the way back to the intersection. This removes much of the supposed reason for bike boxes (in the old design where the bike lanes didn’t start for 100 feet or so past the intersection, the bike boxes would have allowed cyclists to be at the front of through traffic so they could get ‘up and over’ rather than having to wait behind motorists – now there is literally no reason to even get in the bike box. The second problem is one of signage and paint – without a “Stop HERE on Red” sign, motorists don’t typically stop that far back from the intersection – even when white lines exist on the pavement. Coloring the bike box would help but would, I think, not be sufficient. Please forward my email to the CTR people and invite them to contact me if they would like. I’d be very happy to share continued observations as I go through this intersection an average of 2 times per day, usually in the rush hours. Extracted from a comments thread on facebook; name omitted to protect privacy in case they mind. 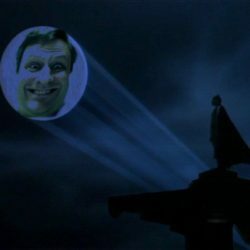 we can always count on our buddy Mike to leave no dead horse unbeaten! Certainly Urban Rail will be great (if we do it right) and we all need to support it, approved but calling the redline ‘useless’ is a bit much. Perhaps useless to you, Mike, but so are dozens of bus routes (and roads for that matter) you will never use – that doesn’t make them useless to the folks who do (and will) use them. (done with the old rail timetables, not the new presumably slower ones which aren’t up yet). The Red Line is ‘useless’ because for most people, it will be a slower commute than the existing express bus service. We spent a lot of capital dollars, in other words, to get lower quality service than what we already had. (And operating costs are likely to be close to express bus with the shuttle-bus costs added in). And it is most definitely not a dead horse – because your agency continues to seek to spend additional scarce rail dollars on the Red Line (repeating Tri-Rail’s mistake of trying to polish a you-know-what instead of building something more useful somewhere else) and on other similarly useless commuter rail lines – meaning those dollars obviously can’t be spent on the CoA project. So tell me, readers, is the argument of the CM guy compelling at all? Before the rebuttal? After? I really mean what I say here – the horse isn’t dead, because it keeps getting fed. 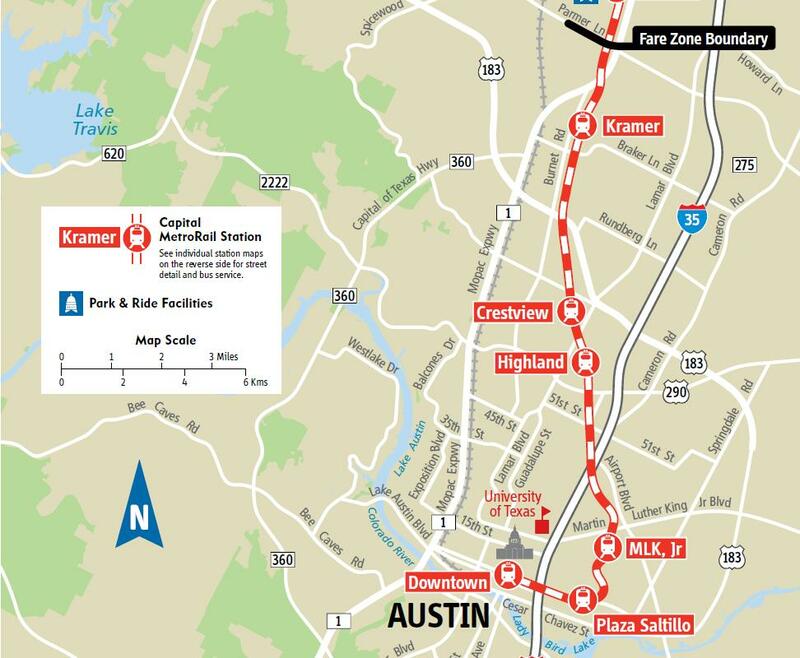 Those rail dollars (federal and local) could in fact be saved for the City of Austin’s urban rail program – but once they’re spent on commuter rail they’re gone for good, and we aren’t exactly swimming in other money to make up the difference. We need to stop further ‘investments’ in commuter rail, in other words, if the urban rail line is to have a decent shot at getting built in our lifetimes. Check out me on KUT yesterday about the intersection problems along Airport and notice that I’m not alone in failing to buy Capital Metro’s BS about it just being a simple education problem. Good job, diagnosis Mose, angina getting some key points across from a variety of interviewees.